New kitchen will include a switch to induction. Since I will also have a steam oven my cooking style might change a bit. Also I expect we'll be entertaining even more, plus kids starting to eat real portions. Trying to figure out what I need and thought it would be nice to bounce thoughts off other cooks. What doesn't need to be replaced: three Le Creuset dutch ovens: medium, large and very large. Demeyere 32cm Multiglide skillet bought recently, as I was sick of scraping fish skin off regular skillets. I've never seen a non-stick pan that browns like this. And so evenly. AND it's supposed to work even better on induction. I love this pan. Now I am thinking of doing mostly Demeyere for the rest but don't have the stomach for big mistakes at this price level. Don't know what to do re wok replacement. I really love my wok but no go on induction. They make a flat-bottomed one that works with induction, but I haven't been able to find any reviews. frying pans, same nonstick from same series, in sizes 20 and 28cm. I need some big thing to boil water. Maybe this should be from a cheaper line. Not sure about smaller pots for rice or veg as I could do those in the saucier or in the combi oven. I don't have induction (other than a single stand-alone burner) so I can't help much on this. That Demeyere is nice stuff. Have you looked at the Mauviel line for induction? That real steam oven should bring much pleasure! I've been slowly replacing a calphalon set I inherited in my parents divorce almost 20 years ago with de buyer carbon steel pans - specifically because I want to be prepared to make the induction switch. I love them. You should check them out. they really take a nice seasoning. For everything other than frying/saute pans I have enameled cast iron. And I still use the anodized aluminum for the stock pots. I think you are right about the stock pots - You want something cheap with a thick disk on the bottom and then thin AL or Stainless sides. Anything more is a waste. Agree on Demeyer and De Buyer. Can't go wrong with those. concur on demeyere and de buyer. also look at komin lightweight cast iron. arthritis in my hands and wrists have made me mindful of buying cookware that i can actually lift. i recommend the blackberry q10, like the one peter creasey has. Cookware is compatible with gas, electric, halogen and induction cooktops and is safe for the oven and broiler up to 500°F. Do any of these brands make sautee pans larger than 28cm? (Do I need this?) I just know all clad has much larger ones. 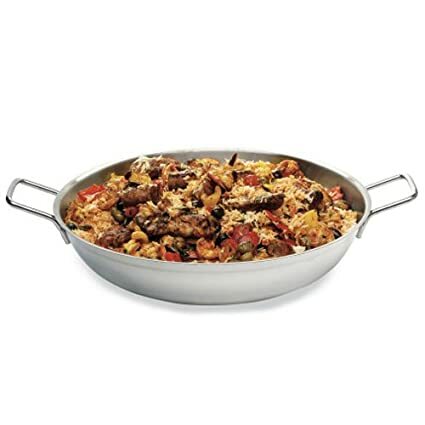 Right now I just have a 14" all clad frying pan but have always wanted something with taller sides. Was planning on all clad again originally but they're really not the best for induction, and very overpriced in Europe. De buyer's biggest is 32 cm. I don't know if you need that. Personally a pan that big would mostly be used for saucy braised things for a quick dinner so I'd wonder about using a pan that needs to hold a seasoning. I agree with AB. The 28 cm Henckle's frying pan (lidded) holds 5 quarts. It's a pretty reasonable price. Paderno makes some nice stuff too. Like this rondeau. Are you sure about the 28cm holding 5 quarts? The 28cm Demeyere is listed as holding 4 litres which is more like 4 quarts. Did meatballs with tomato sauce in the wunderpfanne today. Was able to brown the meatballs without scorching or sticking, then wipe clean, do the tomato sauce and dump all the meatballs back in without crowding. (It has high, straight sides.) Any reason why I shouldn't just buy a lid for this one and make it dual purpose? you can use a stick blender in it without making a giant mess. (And I have an outlet built into the stove control panel!) But what the hell would I use it for? If I only had a heart?